U.S. Muslims clearly express concerns and worries about the future of the country and their place in American society in the wake of Donald Trump’s election as president. Most Muslims are dissatisfied with the direction the country is going, which is a reversal of opinion from 2011. Majorities of U.S. Muslims view the Republican Party and Trump as unfriendly toward Muslim Americans. And most Muslims say anti-Muslim discrimination is prevalent in American society. These worries and concerns are most pronounced among Muslim women and among those born in the United States. But there are also signs of optimism among the Muslim community. Even though three-quarters of Muslims say they face a lot of discrimination, there has been an uptick in the share who say someone has expressed support for them because they are Muslim. And about half of Muslims say the American people, as a whole, are friendly toward Muslim Americans. This chapter also examines opinions about government monitoring of phone calls and emails, treatment of the Muslim community by media outlets and attitudes about the acceptance of Muslims and Islam into mainstream American society. The survey asked Muslim Americans if Donald Trump spurred in them any of four different emotions: worry, anger, hope and happiness. Far more Muslims express negative emotions associated with Trump than positive ones. A majority (68%) of U.S. Muslims say Trump makes them feel worried, and fully 45% say Trump makes them feel angry. On the other hand, some do say Trump makes them feel hopeful (26%) or happy (17%). Trump evokes similar levels of worry (60%) and anger (39%) among the general public as he does among Muslims, although Americans overall are more likely than Muslims to say Trump makes them feel hopeful (40%) or happy (30%). Among the two-thirds of Muslims who identify with or lean toward the Democratic Party, most say Trump makes them feel worried (76%) and angry (57%), while just 19% say he makes them feel hopeful and 13% say he makes them feel happy. Among the 13% of Muslims who identify with or lean toward the GOP, by contrast, far fewer say Trump makes them feel worried or angry, and most (58%) say he makes them feel hopeful. About three-quarters of U.S. Muslims say Donald Trump is unfriendly toward Muslim Americans, with 12% describing the new president as friendly toward Muslim Americans and 9% saying he is neutral. The data also show that about six-in-ten (59%) say the Republican Party as a whole is unfriendly toward Muslim Americans, up from 48% who expressed this view in 2011. Muslim women are especially likely to express skepticism of Trump and the GOP’s attitude toward Muslims. Fully eight-in-ten Muslim women say Trump is unfriendly toward Muslims (compared with 68% of men), and about seven-in-ten Muslim women (69%) view the GOP as unfriendly toward Muslims (compared with 49% of Muslim men). The data also show that on these questions, wariness of Trump and the GOP is higher among U.S.-born Muslims than among immigrants. U.S. Muslims express much more positive views about Democrats’ attitudes toward the Muslim community. 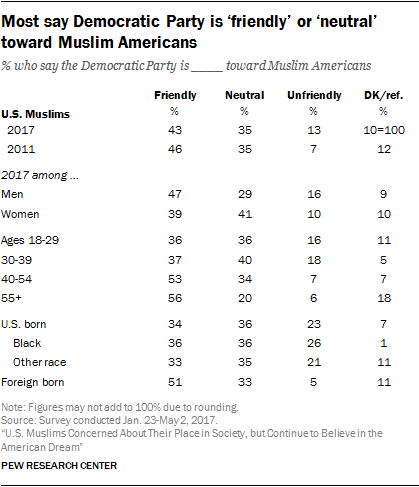 About four-in-ten (43%) say the Democratic Party is friendly toward Muslim Americans, and an additional 35% say the party is neutral toward Muslims. Just 13% say the Democratic Party is unfriendly toward Muslims. Muslims ages 40 and older and those who were born outside the U.S. are especially likely to see the Democratic Party as friendly toward Muslims. Overall, three-in-ten U.S. Muslims say they are satisfied with the way things are going in the country today, while 64% say they are dissatisfied. This is a substantial shift from 2011, when the balance of opinion leaned in the opposite direction. The change in perspective appears to be bound up, at least in part, with the outcome of the 2016 presidential election. Among Muslims who approve of Trump’s job performance (19% of U.S. Muslims surveyed), three-quarters say they are happy with the direction of the country (76%). But among the much larger group of Muslims who disapprove of Trump’s handling of his job as president, just 12% are satisfied with the way things are going in the country, while 85% are dissatisfied. Most Muslim Americans (60%) say coverage of Islam and Muslims by American news organizations is unfair, while just 27% say the coverage has been fair. The view that the media is biased against Islam and Muslims is especially prevalent among women, among whom 68% express this opinion (compared with 52% of Muslim men). And U.S.-born Muslims are more likely than their foreign-born counterparts to say the way the media treats Islam and Muslims is unfair (74% vs. 49%). The data show, furthermore, that six-in-ten U.S. Muslims (62%) say the American people do not see Islam as part of mainstream American society. And, indeed, a plurality of U.S. adults (50%) say they do not see Islam as part of mainstream American society (for more details on how Americans as a whole view Muslims and Islam, see Chapter 7). Just three-in-ten U.S. Muslims say the American people see Islam as mainstream; this view is most pronounced among Muslim men and Muslims born outside the U.S. 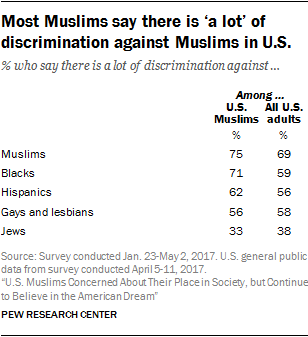 When asked directly, three-quarters of U.S. Muslims say there is “a lot” of discrimination against Muslims in the U.S. – modestly higher than the 69% of U.S. adults overall who take this position. As is the case for the public overall, Muslims are considerably more likely to say there is a lot of anti-Muslim discrimination (75%) than they are to say there is a lot of discrimination against Hispanics (62%), gays and lesbians (56%), or Jews (33%). Muslims are, however, more likely than the general public to say black people face a lot of discrimination: 71% say this, compared with 59% of U.S. adults. Muslim women are more likely than men to say there is a lot of discrimination against Muslims (83% vs. 68%). 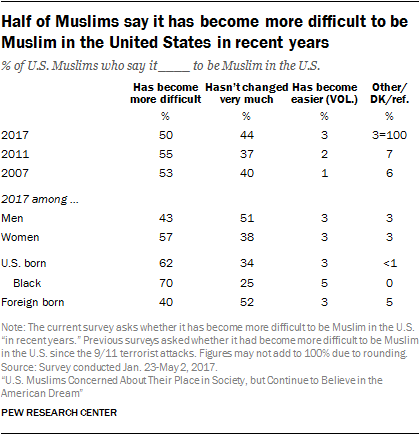 And nine-in-ten Muslims born in the United States – including 96% of U.S.-born black Muslims – say there is a lot of discrimination against Muslims in the U.S., compared with 65% of foreign-born Muslims. Muslim Americans also were asked to describe, in their own words, the most important problem facing Muslims today. 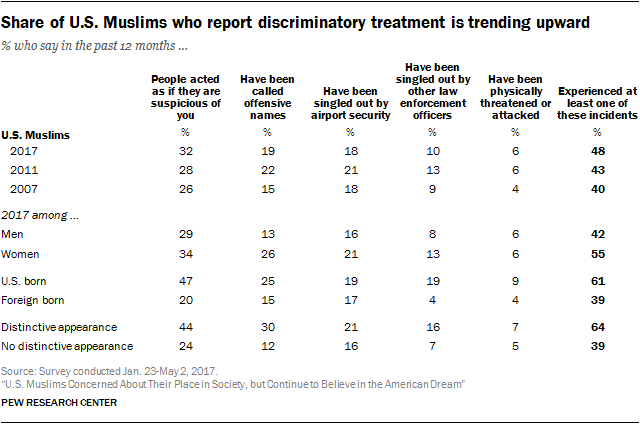 The responses most often center on discrimination, persecution, and misconceptions about Islam and Muslims by the rest of U.S. society. About one-quarter of U.S. Muslims, for instance, volunteer that discrimination, racism or prejudice is the most important problem facing Muslim Americans. Another 13% cite ignorance and misconceptions about Islam as the most important problem. And others say that all Muslims being viewed as terrorists, negative media portrayals of Muslims or Trump’s attitudes and policies toward Muslims are the most important problems facing their community today. The survey also finds that about one-in-five Muslims (18%) say they have seen anti-Muslim graffiti in their local communities. Among Muslim Americans, women are more likely than men (70% vs. 48%) to think their communications are at least somewhat likely to be subject to government monitoring. Muslims were also asked a related question about how worried they are about being surveilled by the government because of their religion. While most Muslims think it is possible that their calls and emails are being monitored in general, fewer express much worry about this happening for religious reasons. Overall, about a third of Muslim adults say they are “very” (15%) or “somewhat” (20%) worried that their phone calls and emails are being monitored by the government because of their religion. About two-thirds of Muslim Americans are “not too” (12%) or “not at all” (53%) worried. The survey finds that more Muslim women than men say it is getting harder to be a Muslim in the U.S. (57% vs. 43%). And U.S.-born Muslims are more likely than immigrants to express this view (62% vs. 40%). An additional 17% cited negative portrayals of Muslims in the media, including movies and television shows. 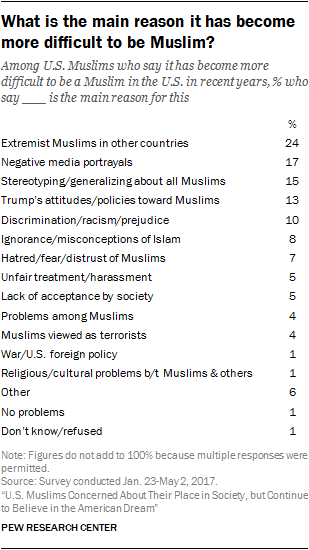 And similar shares mentioned stereotyping of Muslims (15%) and Donald Trump’s attitudes and policies toward Muslims (13%) as the main reasons it has recently become more difficult to be Muslim in the U.S. But while Muslims say they face a number of challenges and express a variety of concerns about life in the U.S., the picture they paint of their experiences is also colored with multiple bright spots. For example, 55% of U.S. Muslims say the American people, as a whole, are friendly toward Muslims, and an additional three-in-ten say the American people are neutral toward Muslims. Just 14% say Americans are unfriendly toward U.S. Muslims. The view that the public, as a whole, is friendly toward Muslims has become somewhat more widely held since 2011, and it is especially common among foreign-born Muslims, among whom 73% say the American people are friendly toward Muslims. Similarly, seven-in-ten Muslims ages 55 and over and about two-thirds of Muslim men say the same. The general public is less likely than Muslims to say the American people are friendly toward Muslims; just 36% of U.S. adults overall say this. In addition, about half of U.S. Muslims (49%) say that, in the past year, someone has expressed support for them because they are Muslim. In 2011 and 2007, fewer Muslims said that someone had expressed support for them because they are Muslim. And while Muslim women, U.S.-born Muslims and those who have something distinctively Muslim about their appearance are especially likely to say they have experienced discriminatory treatment in recent months, these Muslim subgroups also report receiving expressions of support at higher rates.